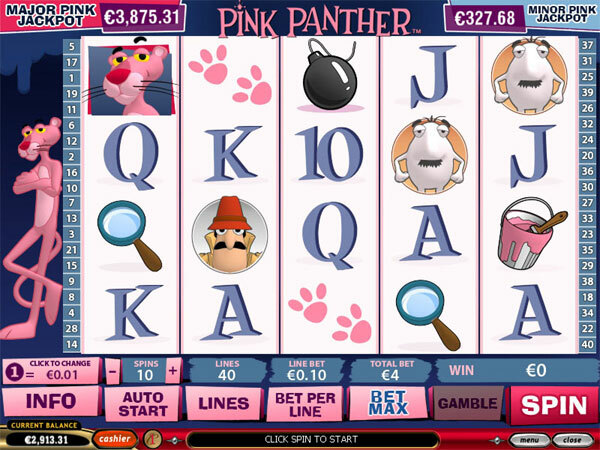 The Pink Panther slot game is an excellent new video slot freshly launched on the Playtech software platform, and based on the classic Pink Panther series and films that dominated both the big and small screens from the early 1960's onwards. This branded MGM slot game is truly a great example of how to make a successful online slot machine. In the few weeks since its launch the Pink Panther slot has already become one of the most popular online slots at casinos such as Windows Casino and King Solomons, appealing to a huge fanbase eager to reawaken long forgotten childhood memories. The Pink Panther slots game does not disappoint in any respect, in fact, it is absolutely jam-packed with special features, five different bonus games and even two dedicated progressive jackpots, all divinely presented by the mischievous Pink Panther and the bumbling genius Inspector Clouseau. A true gem of an online slot game and a must-play game for all fans of the immortal Pink Panther.